Almost 3 years ago I started looking for a way to go back to work after a serious head injury. I had been a special education teacher for more than 20 years but I knew I was physically unable to return to the classroom full-time. I still faced many physical challenges and I needed to find a job that offered flexibility. When I saw an ad for teaching English online to kids in China, I thought it sounded like a possibility. It also sounded like a scam. I was skeptical because the job was with a company I had never heard of in Beijing, China. Even if they were legit, I was skeptical I would like the job at all. That statement may seem strange coming from a lifelong teacher, but my favorite part of the teaching was my connection to my students. I am a kid person. Most of the time, I love kids more than adults. I loved building relationships and being a part of students’ lives. I loved getting to know their families and going to their birthday parties. I loved knowing that I was making a difference in their lives. When I thought about teaching online, it seemed like the computer screen and thousands of miles would be huge barriers to connecting with kids. I was confident I could adapt my teaching style to teach online but I doubted this new way of teaching would be able to fill the hole in my heart I felt from losing a career I loved so much. Nevertheless, I pursued the job and was hired by VIPKID in August of 2016. VIPKID teachers have the flexibility to open classes whenever they would like to teach. Then, parents go online and book the teachers they would like for their child. I was warned it could take a little time to gain students but when I opened my classes each week, they quickly filled. 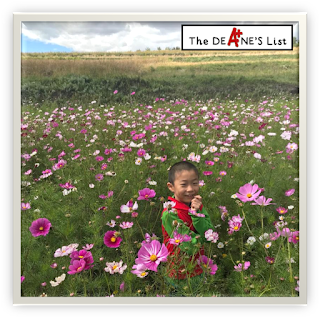 Initially, I taught so many Chinese children I had trouble keeping them straight. Before too long, I started seeing familiar faces. 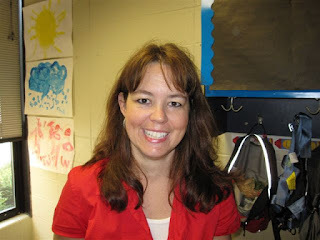 Since each lesson is one on one, I began to get to know my students. I learned their names, ages, siblings, pets, favorite snacks, and extra-curricular activities. I found myself really enjoying my time teaching and the relationships I was building with my students. Soon, I developed several favorite students. One little boy I started teaching not long after I became a VIPKID teacher was John. He was five years old. John was gifted in several areas including musically. He loved to sing and he would often play the piano before class for me. He was also very artistic, and he did beautiful artwork for his classroom projects way beyond the level of most adults. I looked forward to our lessons twice a week and when we were not in class, I often talked about him to my friends and family. One day I realized John was not scheduled at his usual time. The next class John also missed. Then he missed the next week and the next. I had no idea why he was not in class. I wondered if I upset his parents. I wondered if something had happened to him or his family. I waited and watched my schedule and still, John did not return. After several weeks, I sent a message to the company asking if they could give me any information because I was worried about my student and his family. I received a form response that he was probably getting ready for the end-of-the-year exams. I knew this was not the case since he was only five years old. Heartbroken, I decided John must have discontinued his VIPKID classes or had chosen to use another teacher. Then one day John reappeared. He told me he had been in Japan on a long trip and he had not thought to tell me beforehand that he would be going. After that, I exchanged email information with his mom, so we could contact each other outside of class. Since then, John’s mom has consistently sent me pictures of their other travels and of John’s regular activities. I continue to see John on Tuesday and Friday mornings for English classes and he continues to make excellent progress. Months ago, John’s mom contacted me to ask where I lived because they wanted to visit America. Eventually, she sent me pictures of their visas. As they began planning their trip, John’s grandmother and grandfather decided they wanted to come as well. Over several weeks, I helped John's mom make arrangements as she planned the itinerary for their trip. Now, we are hours away from their arrival. I can hardly believe how excited I am to finally meet this amazing little person who has made a huge impact in my life. I can’t wait to meet his family who has welcomed me into John’s life and allowed me to learn about their culture and their lives. While I wait, I am an excited and emotional mess. I am thankful for John for so many reasons. I know John gave me back the joy of teaching. He taught me life’s challenges may be incredibly difficult and may force you to give up things you love. Even if you face challenges that completely change your world, you can begin again, even skeptically. Typing this life lesson is pretty easy to do. Learning it was much, much more difficult. It has been almost five years since I had to leave my special education classroom. It has been a long journey learning to manage my health and figuring out what I am able to do. It has also been an unexpected blessing to find a way to continue to do what I love to do- hang out with young people. In counting my blessings, I realized that five-year-old John was able to scale the barrier of the computer screen and thousands of miles. He was even able to perfectly fill the hole in my heart. I will post some pictures soon of our time together. 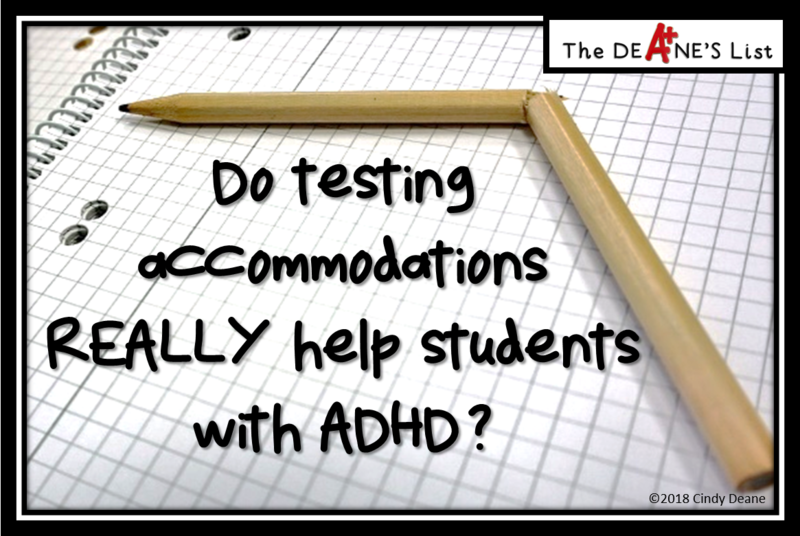 Do testing accommodations REALLY help students with ADHD? A recent study suggests offering students with ADHD testing accommodations such as extended time or frequent breaks does not improve test scores. This study, Academic Testing Accommodations for ADHD: Do They Help? was conducted by Alison Esposito Pritchard, a clinical psychologist at the Kennedy Krieger Institute in Baltimore. Along with the other researchers, she examined the test results and accommodations of 96 students with ADHD in Maryland. Researchers concluded that none of these accommodations were associated with better test performance by the students on their Maryland School Assessments compared to similar peers. It seems logical that testing accommodations would be helpful to students. The results left researchers wondering why their results showed the opposite. The researchers suggested three possible reasons. Students may not be taught how to use accommodations. Accommodations may not be presented the same way (computer read-aloud vs. teacher read-aloud). Students decide whether to use the accommodations they are given. This study was published in Learning Disabilities, a Multidisciplinary Journal. To learn more check out this article in Education Week. What impact could this research have for teachers and parents who make decisions about testing accommodations for students? These results raise some practical questions worth asking. Do students know what their accommodations are? How are these accommodations administered? How often are breaks given? Do students ask for breaks or are they at given intervals? How will a read aloud accommodation be given? Does your student know how to use extra time? What does reducing distractions mean? Is anything done to help students learn how to best use their accommodations? Does this new research change your ideas on testing accommodations? Let me know your thoughts in the comment section below. To sign up for one of these upcoming Fast Pass events, click the link below, search by your city, and click the date you are interested in. Morning and afternoon sessions are offered each day. You need to register as soon as possible because many dates and times are filling up and space is limited. 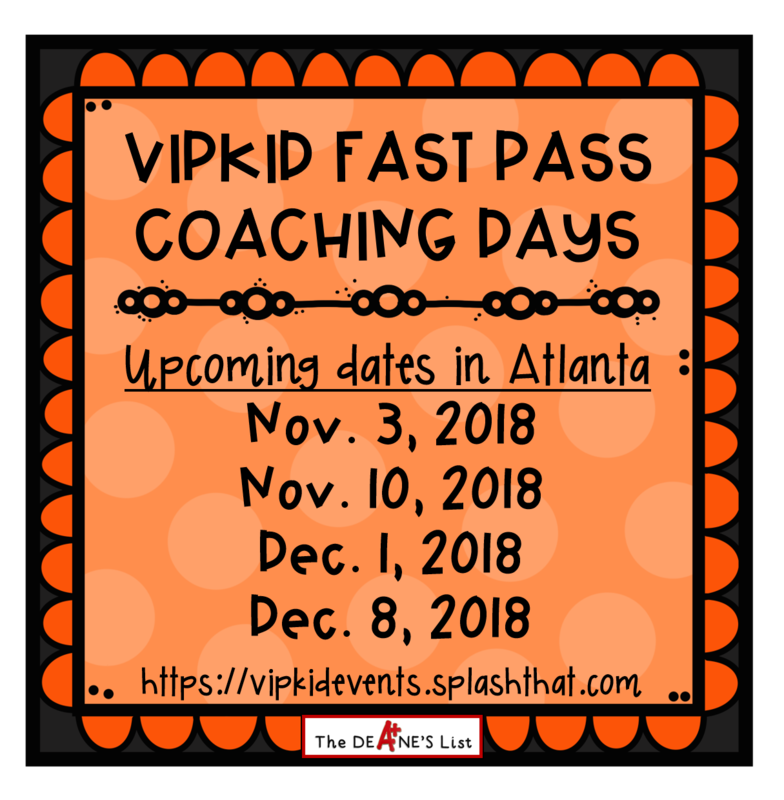 The dates above reflect upcoming dates for coaching days in Atlanta but classes are now offered in cities across the country. You can also check upcoming dates for Dallas, Orlando, Tempe, San Diego, Charlotte, Houston, Austin, Phoenix, Sunrise (FL), Centerville (UT), El Segundo (CA), and Lombard (IL). 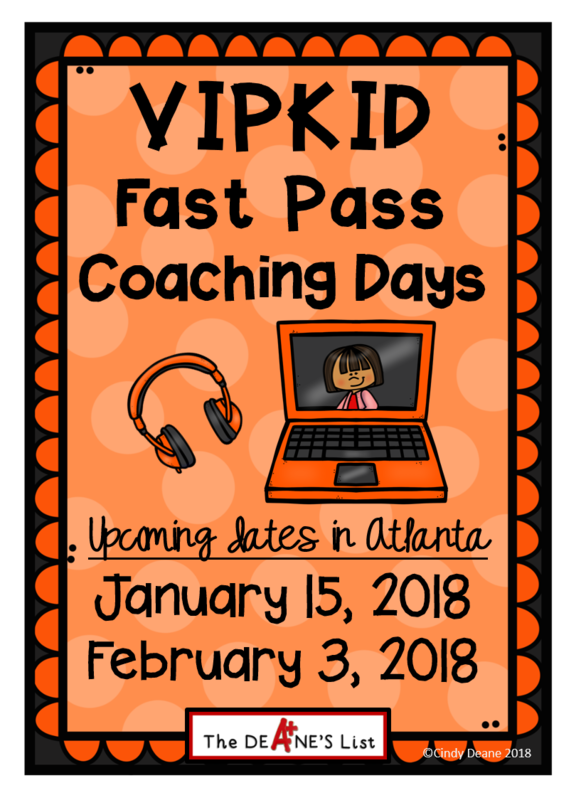 Do you have questions about VIPKID Fast Pass Coaching Events? Leave your questions in the comment section below and I will do my best to answer them. Hello to all you amazing VIPKID teachers out there! 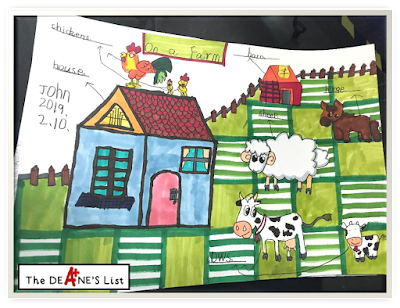 I recently put together a simple but fun reward system for Chinese New Year that my students have really enjoyed so I wanted to share it with you. It features cute Chinese New Year images with matching words. I have also included an adapted song that includes each of the images if you want to sing along as you reward your students during class. You can download this free resource by clicking the image below. If you find this helpful, feel free to share it with others using the social media buttons below. 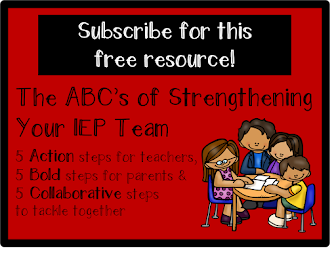 To download this visual in PDF form, please click the IEP box below. You can make The Deane's List today! 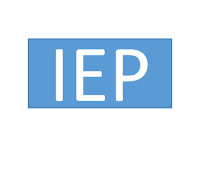 Lost in the IEP Maze? Have you ever wanted to call your mom to tell her you were on the Dean's List? 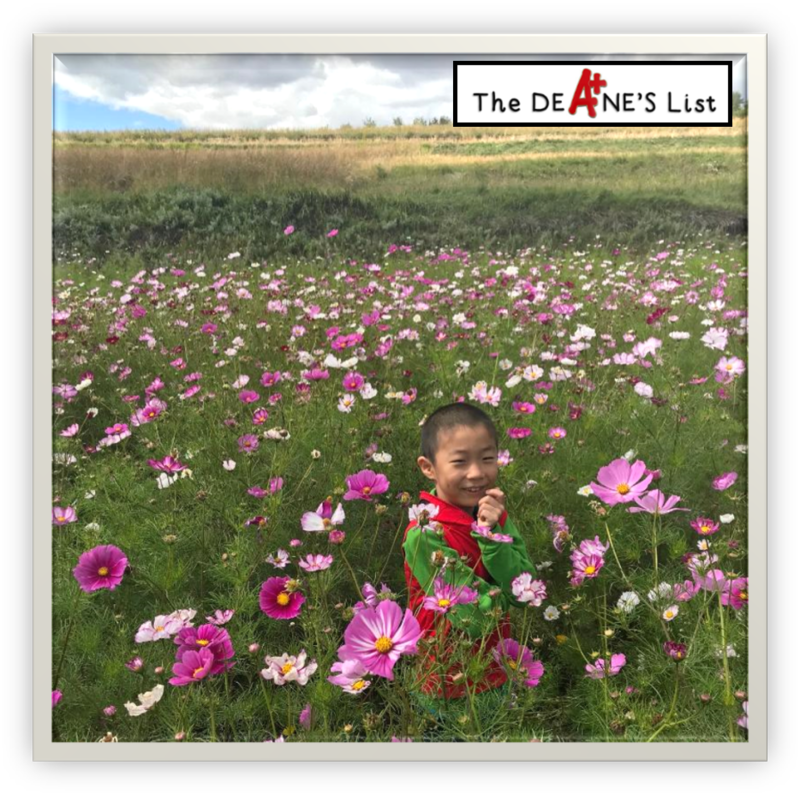 © 2015 The Deane's List. Ashleigh Template designed by Georgia Lou Studios All rights reserved.